Pork producers with operations in southern Minnesota, northern Iowa, and northeastern Nebraska. Features company profile, partners, and feed mill information. Model and talent agency in Florida. sells new and used refrigeration units and equipment. Offering farms and rural property. Hartikka Tree Farms, is a family run business started in 1955 growing Christmas Trees as a part-time operation and have grown into a full-time business on three farms. We are located in Eastern Connecticut near the Rhode Island state boundary. Precision and general machining shop. Staff profiles and information about services. Iowa club calf producer. Site offers information on the farms production sales. A turfgrass producer with farms in Maryland and Illinois, providing premium Kentucky bluegrass sod and bentgrass varieties. A drill-bit manufacturer for the oil, gas, mining, and geothermal industries. Includes information about new technologies, rig counts and a library. Provides CPAs with client newsletters, brochures, web sites, links to tax, business and financial tips, and a tax planning speech. information and pictures of danish fishing vessels, cargo ships, my work as naval architect and shipbuilding. Wholesaler with several farms in California, offering a variety of palm trees, including large sizes. Someday Farms has been breeding exotics since 1975. A great deal of information on miniature zebu cattle and a few pictures. Bittersweet Farms is located in western North Carolina, and produce Belted Galloway cattle. Suppliers of modular aluminum truck racks, and ladder racks. Consulting firm providing engineering, licensing, economics, asset management and project support in the water resources and hydropower industries located in CA. Provides comprehensive services for water well drilling, well and pump repair and maintenance and environmental drilling. Certified hardwood tree farms in Costa Rica. Water-Reel self-traveling sprinkler systems for one to thirty acres on sports fields, horse riding arenas, pasture, nurseries, sod farms, farms, ranches and large estates. The packaging and marketing agent for Dykeview Farms and other Annapolis Valley farms, shipping soft fruits and berries. Products, services, business overview, research and development and location. Develop, design and supply complete fish farms and supply prefabricated system components to existing farms. Includes technical specifications and drawings . The packaging and marketing agent for Dykeview Farms and other Annapolis Valley farms, shipping soft fruits and berries. Lists products, services, business overview, research and development and location. 25 Susan Christensen Photography Portrait photographer. Photos and history of Water Oak Farms in Bradford County, Florida. Offers CNC machining and turning services. Presents an equipment list, staff profile, customer list, and contact information. Specialized in importing and distributing of fine foods from Europe. Product details by country of origin. Broker and contact details. Grows and exports a large variety of fresh flowers and pre-made bouquets from farms located in Peru, Colombia, Ecuador and Costa Rica. Details services of US and European subsidiaries and includes information on breeding, propagation, and distribution programs. This site provides information about Superior Farms, a US supplier of lamb, as well as recipes, nutritional data, and information about their products. Chelsea Farms Alpacas. Located in Renton, WA we provide everything from sales and breeding to transportation and alpaca apparel. If the business hours of Christensen Farms in may vary on holidays like Valentine’s Day, Washington’s Birthday, St. Patrick’s Day, Easter, Easter eve and Mother’s day. We display standard opening hours and price ranges in our profile site. We recommend to check out christensenfarms.com/ for further information. 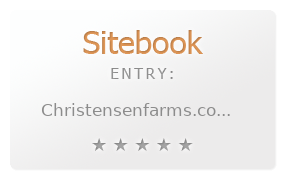 You can also search for Alternatives for christensenfarms.com/ on our Review Site Sitebook.org All trademarks are the property of their respective owners. If we should delete this entry, please send us a short E-Mail.